I moved into my house over 8 years ago. 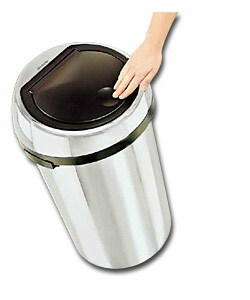 The day after that move I bought a Brabantia kitchen bin – a nice big shiny stainless steel one. As I got to know more of the neighbours it soon became something of a running joke that everybody had bought the same bin. Some years later the hinge on the lid broke. I called up customer services and they sent me a new one (of an obviously better design). Over time that lid also broke. The catch wouldn’t work reliably, and the plastic by where it fits around the handles got cracked (by people not putting the lid back properly). Eventually I could tolerate it no more, and I looked into getting a new lid (or maybe even an entire new bin). As luck would have it Brabantia sell their products with a 10 year guarantee. I ordered a new lid online. Somewhat annoyingly I received an email the next day asking me to send the old lid back, but it came with detailed packing and (free)post instructions – so no major drama. I went about fashioning a temporary lid out of some cardboard that was otherwise on its way to recycling. A little over a week later I got another email saying that the new lid was on the way. It took some extra days to arrive because of heavy snow, but my bin now looks good as new (and the lid works better than ever). Brabantia’s product may not be the cheapest, but their stuff is well made, and when that’s backed up by a great guarantee it makes for a happy customer. We have said bin. They are so well made;we haven’t had a defect in 4 years. Can’t remove the product sticker though despite repeated attempts!